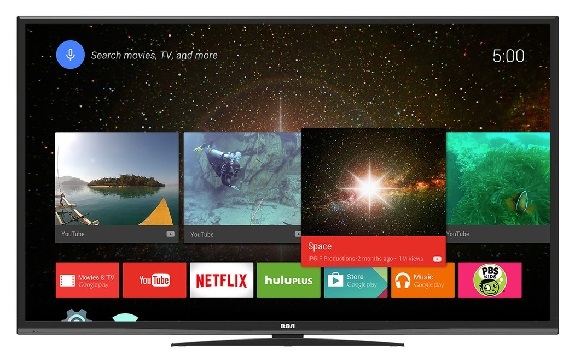 With initial retail distribution in Walmart, Sears, hhgregg, Target, Brandsmart and Rent-a-Center, RCA’s RCA 55” 4K Ultra HD 120Hz Android TV features stunning 4K video, an advanced upscaling engine to enhance lower resolution 1080p to near 4K quality, and full Android TV Smart functionality – with over 1200 of the leading apps, customized home screen, voice search, Google Cast from smart phone or tablet (iOS and Android), Android Gaming with Bluetooth capability, and full access to the Google Play Store to download hottest apps, music, movies, games and more. RCA’s Android TV will also be available in 50” and 65” models, as well as in both a standard slim line modern high-gloss black cabinet, and premium metal slim line version. Full product details are available here: http://bhipr.co/1M41O6q. MSRP: 50″ $499/$599 (premium design), 55″ $699/$799 (premium design) and 65″ $999/$1099 (premium design). Your favorite content and apps: Get the apps you love for your TV: Netflix, YouTube, NBA Game Time, and more are available on Android TV. See apps for movies, shows, music, sports and videos at g.co/androidtvapps. Android TV also supports Cast Ready apps that you can cast from your mobile device or laptop to the TV. Discover Cast Ready apps at g.co/castapps. Good thing I was directed to your article. I found it very interesting and informative.